Walking in Hyde Park, Scott Mannion overhears a weird conversation and parts the bushes to see a man in a turban holding a stone and wishing for his own destruction. A flash of light and the man has disappeared, leaving behind only "The Sinister Stone." Intrigued, Scott brings the rock back to his flat and wishes he was the richest man in the world. The stone squirms in Mannion's hands and he throws it across the room in revulsion. At the moment, Scott's maid enters the room and informs her boss that a man asking for money is on the doorstep. Mannion wishes the man would disappear... and he does! Minutes later, a lawyer approaches Scott at the front door and informs him that a rich relative has died and left Scott a massive fortune. Elated and feeling like the most powerful man in the world, Scott Mannion wishes for a deluge to wash away all the "vermin" around him. An earthquake and typhoon kill thousands and Scott falls into a funk, confessing all to the police, who are convinced he's crazy and have him committed. Meanwhile, the two Scotland Yard detectives who took Scott's confession have vanished with "The Sinister Stone!" Boy, it sure helps when Stan is hoisting up a heaping helping of "homage" (this time, obviously, to "The Monkey's Paw") to have on board one of the greatest funny book artists of all time, Russ Heath. Russ had been good but still a bit sketchy in the art leading up to this story but here, he really lets loose. The splash is an intense close-up of Scott and readies you for the "suspense" on the following pages. 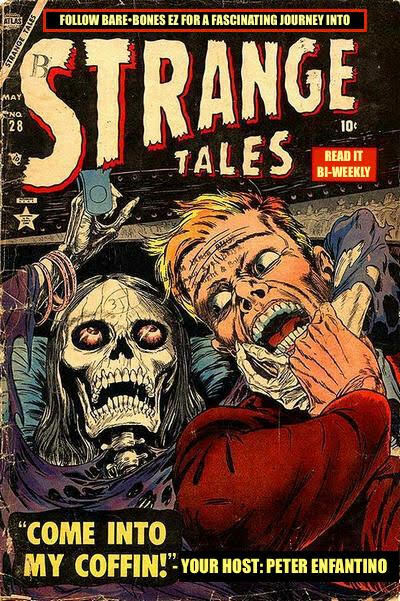 A collection of Russ Heath's Atlas horror stories would be an essential addition to a fan's library. The story, though it's an old one, is not bad; but we're never told why Mannion has money problems (but can still afford a ritzy flat and a maid).The massive death toll is something you could only enjoy during the pre-code years; post-code we might get some buildings collapsing but that's about it. "I Deal in Murder" is a silly Red-bashing ski-fi tale about a Commie spy sent to America to steal the secret of our new robot army. 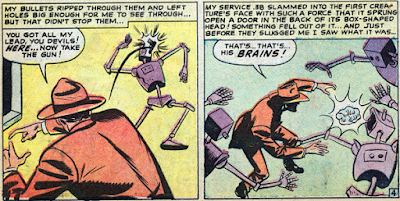 The big reveal (that one-half of the think-engine behind the automatons is himself a robot) is clumsily dropped and Bill Everett's art looks rushed. "The Dark Factory" has a bit of charm and mystery to it despite its brevity. A man takes a job at a factory but isn't given any lessons in using his machine. The other workers look like zombies and when he questions what are in the black boxes he's assembling, his boss tells him, "Death!" Frightened, the man runs out of the factory into the street and is hit by a car. He awakens in a hospital bed as a nurse is administering medicine from one of those black boxes! Who runs the factory and who is selected to die? I don't know and neither will you but it's a creepy concept nonetheless. 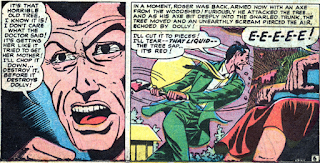 George Tuska's art is about as bare minimum as you can get in a funny book. In the dim-witted "The Waiting Grave!," Lazlo grows tired of his fortune teller wife, Rhena, and years to inherit her riches (ostensibly to buy new clothes since the poor sap wears the same hair vest and blue jeans throughout the story! ), so he does it the old-fashioned way. After the old crone is dispatched, her ghost haunts Lazlo, informing him he'll die by freezing and soon occupy the grave next to hers. The dope scoffs but then finds that the witch donated her riches to charity and he's got no dough for food; soon he's following Rhena off to the meat market, thinking she's being very nice helping him out. Meat market... meat locker... death by freezing... sheesh. Suzanne Lavelle has led the life of French con-girl, working with some very bad men, but her peaceful existence gets turned on its head when a con goes bad and the mark is murdered. The police at her heels, Susie hops a train and meets a pretty young blonde who's heading for a date with matrimony. The full story comes out over a long evening; the blonde, Marie Duclo, is marrying the Count de Varga and all sounds ideal but the 50,000 franc dowry the girl must hand over. But the girl's dreams are dashed when the train crashes and she's killed; Suzanne sees this as the perfect way for her to go underground and evade the French police, so she steals the dowry money and heads for the Chateau of Count de Varga. When the girl gets there. she discovers the Count and his aide, an ugly old witch, are running a con themselves: they invite pretty girls with money to the castle and then murder them. Luckily, the French police have been tailing Suzanne and arrive just as the boom is about to fall. "The Frame-Up!" is an awful mess, with some of the most amateurish artwork I've yet seen and a tired plot that plods along its seven pages as slowly as George R. R. Martin writes his Game of Thrones books. But "The Frame-Up!" 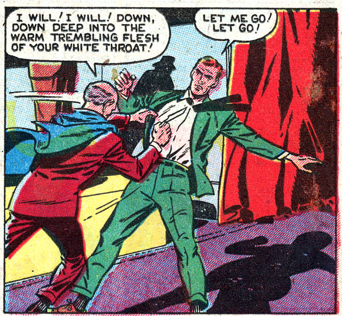 perfectly illustrates why Suspense is a different type of book than the other anthology titles. It's not a straight horror or SF title, it's also got a dose of the thriller as well. In fact, this stinker would have made a perfect radio show. "Felix the Great" tames the wild animals but he can't seem to tame his wild woman, Tomato (no, seriously, Tomato! ), who can't seem to keep her eyes and hands off Felix's assistant tamers. So Felix nips his wife's romances in the bud with accidents that leave his aides sans heads, arms, and other body parts. After two handsome men meet gruesome fates, Tomato's had enough and she turns tables on Felix the Shredded. 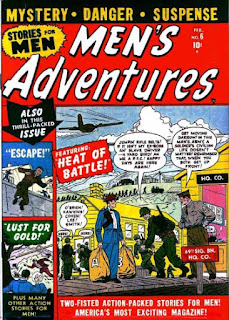 Seven pages of sheer, beautiful lunacy show what Atlas could do when all the ingredients mix well, from Big Everett's exaggerated characters (Felix, a broken-toothed Quentin Tarantino, has a muscleman's physique when he doffs his shirt) to the sickening crrrunch! of Aide #1's head in the lion's maw to circus owner Mr. Thornton's astounding ignorance that something might be going on around his big top, even after the high mortality rate. What’s in the locked door at Kroger mansion? The secret that has sent butlers and maids screaming into the night is also what keeps Vincent Kruger alive. When his latest manservant leaves him stranded, Vincent sits wondering what to do when a stranger pops up in his sitting room. Vincent quickly discovers this is no stranger, but his old lab partner, Otto Van Shorn! 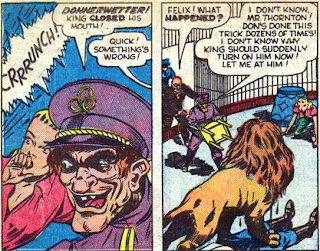 Disfigured in a lab experiment gone awry, Otto has come back to his old partner to steal their invention, Formula-X! 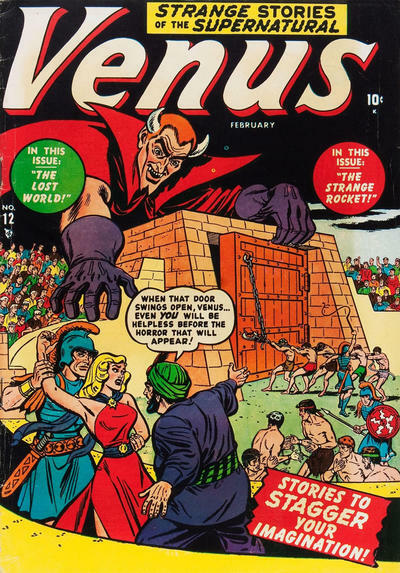 Threatened with death, Vincent hands over the key to the secret room and Otto enters but moments later, the castle is “reeked” with screams and Vincent tells us, via flashback, that Formula-X went horribly wrong when Otto injected Vincent’s entire family with the experimental drug and they were transformed into giant fanged creatures. Particularly grim and deliciously sick for its time (one of the Krugers injected is a baby! 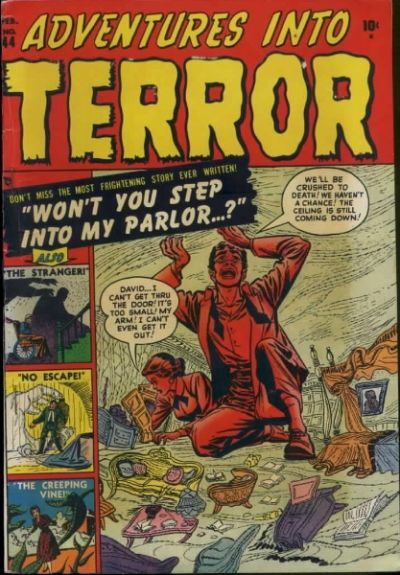 ), “The Stranger” is loads of psychotic fun but one minor detail may have slipped the writer’s mind: the scene where Otto is horribly disfigured has been omitted! The disturbing finale of "The Stranger"
Botanist Asher Brockton receives an exciting package from one of his explorer buddies in the Amazon, a rare new species of flesh-eating vine. Without hesitation, and ignoring the pleas of wife Iris, Asher transplants the foul-smelling creeper in the greenhouse. Feeding the ravenous vine, Asher discovers that every time it gorges itself, a new stem grows and takes on the color of its recent meal. Within days, Asher and his wife stare in terror at the giant carnivore that has taken on the colors of the family pets (“the door was slightly ajar when I… oh, but that’s nonsense, dear!”). Iris makes Asher promise he’ll destroy the monster but, later, when she checks on hubby’s progress, she discovers the plant has taken on yet another new color. Another sick little treat, "The Creeping Vine" offering up at least as many guffaws as shocks. Iris’ observation that the new vine looks just “like… like the cat” and the subsequent shades of “Spot” had me spitting out my coffee. 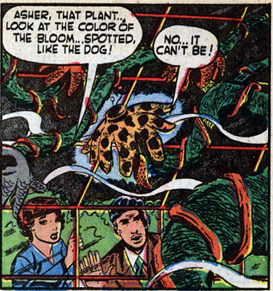 I don’t know about you, but if I received a flesh-eating plant in the mail, I’d definitely plant the thing at my house. In "No Escape," Harry Dunn sets foot in a new ‘burb and the locals have him mistaken for the local millionaire. A light bulb goes off over the con man’s head and, before you know it, he’s taken the place of the rich man’s butler. 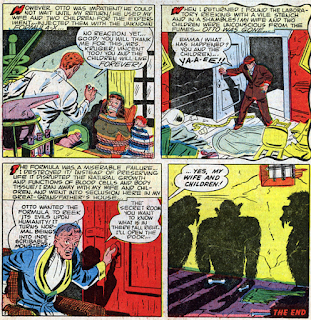 Harry kills the millionaire and dumps his body, taking his place in the mansion and fooling everyone including the man’s jealous relatives, who have Harry committed to an insane asylum so that they can inherit his wealth (it was a heck of a lot easier in the 1950s to be sent to the looney bin). There, the cousins admit they’ll be slowly poisoning Harry until he dies and the estate transfers to them. Some really nice Heath art (check out that splash!) and an effective, if overly familiar, shock ending. Newlyweds escape a terrible storm only to realize they’re trapped in a house of horrors. 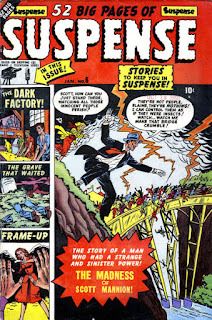 A really badly-written (“I would a thousand times rather brave any storm than spend another second here!”) and amateurishly-illustrated story, “The Storm” is one of those time-wasters that convinces you Stan Lee might have had some relatives in for the weekend and dared them to write a terror tale despite their never having lifted a pen in their lives. Despite the weak final story, this could be the best single issue of an Atlas horror title we've encountered yet. "When you come to the fork in the road, Dave, take it!" A con jumps the wall and accidentally boards a rocket ship for the moon in this issue's lone genre offering, "Escape." 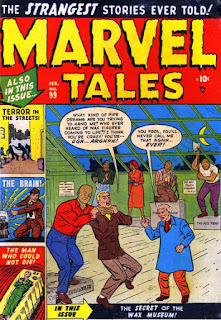 Anything interesting about the protagonist (he's evidently very afraid of being alone and there are ghosts haunting him but we're never given any explanation on either facet of the character) is wiped out by the brevity of the tale (four pages) and the ugly Mike Esposito art (which almost looks like one of those test boards wanna-be artists turn into the publishers as auditions). 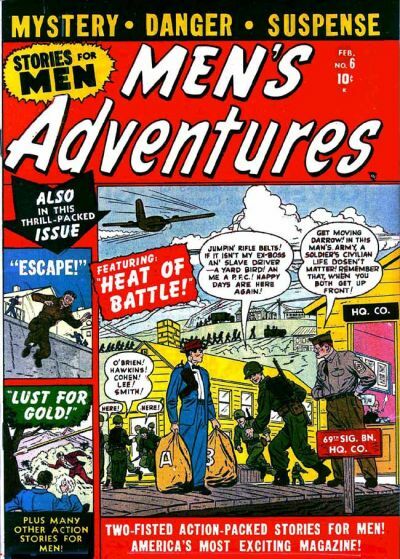 Men's Adventures heads off our radar (focusing mostly on war comics) until #21 in early 1954. Detective Clancy has finally discovered the truth behind the thousands of men gone missing recently in the US; aliens from Jupiter are kidnapping men and stealing their brains to use in Jupiterian robots! The spacemen get wind of Clancy's snooping and throw him into the next ship to Jupiter. There he's forced to watch his countrymen have their brains scooped out with a spoon and dumped into the metal men. The brainless bodies are then dumped into space. Clancy manages to stow away on one of the saucers bound for Earth, but when he gets back he can't convince his superiors that spacemen are behind the disappearances. The poor sap is booted off the force but he knows it's only a matter of time before the aliens come back for him. Our old friend, Hank Chapman, is responsible for writing "The Land of Missing Men," a slow-moving and utterly boring SF yarn enlivened only by some silly dialogue ("Maybe I'm just a mashed potato-hearted cop...") and even sillier head-scratchers (while cruising through space, the brainless bodies are dumped in space and Clancy hangs "on inside for dear life," ostensibly without a space suit or oxygen!). In 2080, all the worlds in the galaxy have gotten together and decided to make peace. To that end, all governments decide to ship all arms to a remote planet and blow it all to kingdom come (planet included). The only roadblock to complete peace is the space pirate, Barum (think Bluto with space tights), who plots with his numb-skulled goons to conquer all the planets once they're weapon-free. Barum and his boys head to the planet Eela, where they pull off the biggest heist of laser guns and protoplasm-blasters ever seen, then they kill everyone on the planet. Heading back out to space, they tangle with a couple of police ships and they incur heavy damages to their rocket, necessitating a landing on an unknown world. 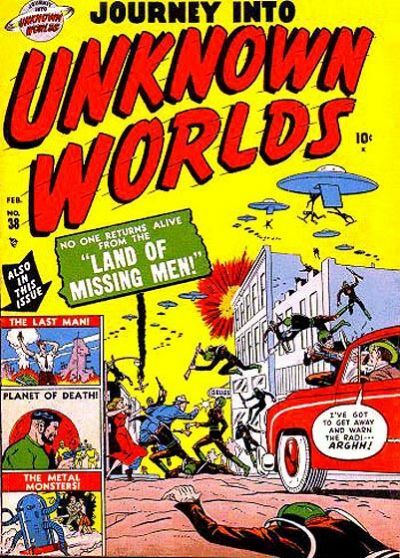 Yep, you guessed it: the boneheads land on the planet chosen for destruction. Ka-Blooey! "Planet of Death!" 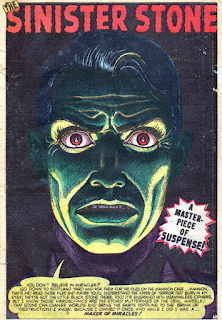 is one heck of a silly story but sometimes that's just the ticket with these 1950s SF tales. Barum displays George Tuska's trademarked gritted teeth and open mouth and exclaims such manly space pirate dialogue as "Hah, why worry... We're here and e're safe! Plenty of time for repairing, and meanwhile we'll be snug as a bug in a rug!" The climax, where the three dummies realize that they're about to become scattered atoms, is comedy gold. MAD's Dave Berg provides the visuals for "The Last Man," a silly four-pager about a crackpot who tells the editor of Unknown Worlds he's dreamed of world-wide destruction courtesy of the hydrogen bomb. The art's great but the story goes nowhere. 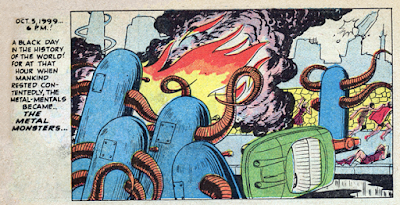 Much better is "The Metal Monsters," another end-of-the-world yarn that takes place in 1999. Man has grown lazy and left all his chores to"Metal-Mentals," robots who can cure disease, think for scientists, and pick the winner of the Dodgers-Cubs game at noon. Unfortunately, as happens in these idyllic situations, the metal men rebel and destroy just about every one in the world, leaving our Earth scarred and charred. The metal guys aren't the sharpest tools in the shed, after all, when they march into the water to conquer the sea, leaving a handful of humans living to start all over again. This time, without help. Some nice Golden Age art by Pete Tomlinson and widespread chaos highlight this above-average cautionary tale. Sculptor Albert Simms scoffs at his best friend's advice to seek out the very life-like sculptures at Samuel Hoskinson's wax museum but, eventually, gives in and visits the little curiosity shop. What he finds there astonishes the frustrated artist; Hoskinson's figures are insanely perfect, maybe too perfect. Simms discovers just how perfect after Hoskinson makes him part of the gallery. There are 10,000 Wax Museum stories in the Naked City and this is not one of the better ones. Since this is one of the rare instances where the writer is credited, we know exactly who to blame. 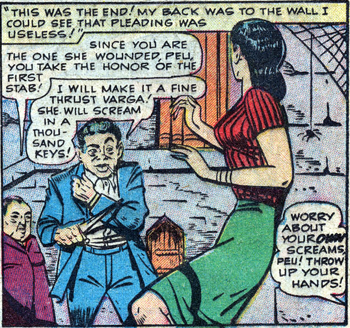 Don Rico is a much better artist than writer; his "shocks" are telegraphed far in advance and there's nothing vaguely original about the set-up. 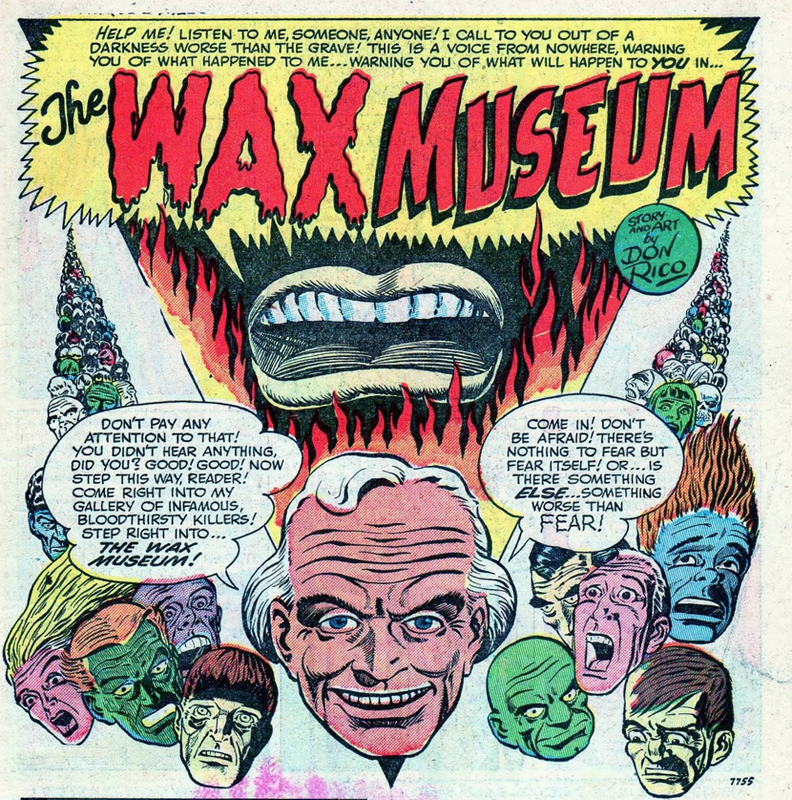 I would question why anyone would want to visit such a boring wax museum. I mean, exhibits labeled "Vanished Judge" and "Insane Sculptor?" Definitely not competition for Madame Tussaud's. 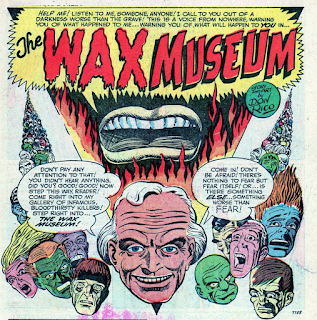 But, hey, at least Rico is a competent visualist, which is more than can be said for the scribbler responsible for the horrible cover, which represents "The Wax Museum." In "The Man who Couldn't Die!," scientists race to finish an elixir of eternal life but one of them gets antsy and murders the other, injecting himself with the untested formula his colleague had whipped up. The dope enters a coma but still has all his senses. So it's no picnic when his doctor declares him dead and he's buried alive. Awful art but a pretty nasty climax elevates this four-pager to an average ski-fi tale. A writer of "weird fantasy and science fiction" gets his inspiration from haunted houses and hits a goldmine when he discovers a book of magic in his latest haunt. One particular incantation strikes his fancy, that of mind reading. He gets the power but it turns out his gift is only for hearing thoughts of murder and evil. Another credit for writer on this one, and it's our old friend, Henry (Hank) Chapman, who would go on to write tankloads of DC war tales in the 1950s and 60s. "Terror in the Streets" is a very-average fantasy tale but it's enlivened by a few interesting bits, both visual and written. The poor sap can only hear dastardly thoughts and the final one is of the two thugs who are about to knife him. 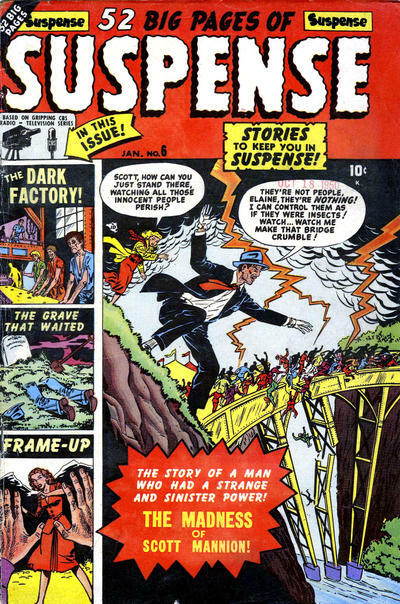 And, for a finish to a very slapdash and ho-hum issue of Marvel Tales, we get the story of big-brain, giraffe-necked Professor Hartley, who's on the verge of discovering something very earth-shattering. Just don't ask him what it is because he'll have a meltdown. Which is exactly what happens and the egghead ends up in the hospital, contemplating why the human brain cannot handle the super-duper stress it's sometimes put under. A robot brain! That's it! That's what the professor has always been itching to perfect. And quicker than you can say "Adam Link," Hartley has built and programmed "The Brain," a big red soup can with an attitude and bad manners. When Hartley's assistant badmouths the tub of nuts and bolts, the poor kid gets a broken arm for his wisecracks. Later, Hartley and the Brain devise a way to tap the energy of the sun (not really giving much thought to what that might mean) and regret it when they both get fried (along with a circumference of fifty miles) in a fiery climax. Just what the doctor ordered after the first three sleepfests, "The Brain" is what's best about rediscovering these loony strips. Never mind the concept of science; these kids wouldn't know science if it was explained to them in school. Just pop in some crazy art and some action and they'll lap it up. We question whether these kinds of stories are examples of lazy writing but I swear Stan and the boys were whooping it up when they'd concoct yarns like "The Brain!" and "The Stranger!" I know I was whooping it up during Hartley's meltdown and gradual realization that he may have made some critical errors in his formula for tapping the sun's powers. Whoops! Little Toby has quite the imagination and, one day, he comes back to his parents’ ranch home to tell them he’s seen a rocket ship and spacemen. The aliens, Toby tells his dad, have asked him if he would like to fly back to their planet with them if his parents wouldn’t mind. Toby’s father chuckles and gives his permission, not realizing his son is not pulling his leg this time. Years later, Toby’s mom and dad still wait for their son’s return. A bit of a melancholy finale, which is a nice twist for a title like Venus, which leaned more towards the fanciful and disposable. One wonders if the aliens, who looked friendly enough, will ever return the boy to Earth. "The Man Who Disappeared" is a dreadful rip-off of The Shrinking Man in which the world’s tallest man, tired of mockery, takes experimental shrinking drugs. It works too well and the man vanishes into nothingness. The weak Sekowsky art doesn't help matters. Poor Roger Catlett is henpecked by his shrewish wife and mother-in-law into buying a creepy old house in the countryside. Despite warnings from the old man who sold him the place, Roger waters the strange tree on the property and, suddenly, mom can’t seem to focus on anything but sitting beneath its branches. 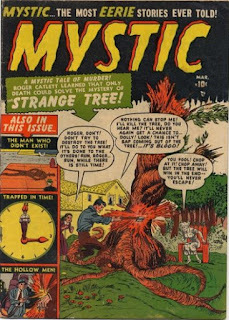 We’re never given an explanation for the power of the tree and the story’s much more effective for staying on the vague side. 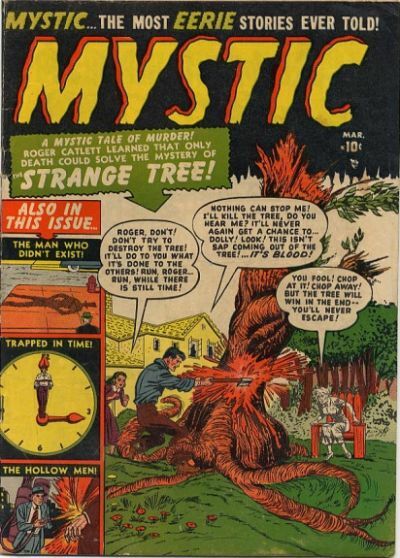 “The Strange Tree” contains quite a bit of that clunky pre-code horror dialogue but keeps the reader’s attention right up to its shock finale. 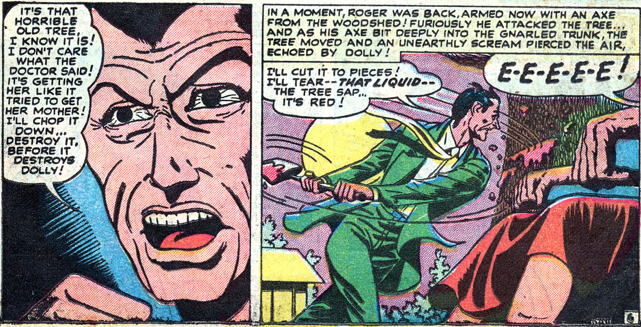 This poor sap has run afoul of "The Strange Tree!" Robert Fletcher answers an ad for employment and meets a professor who offers him five thousand bucks to test out an experimental time-travel machine. 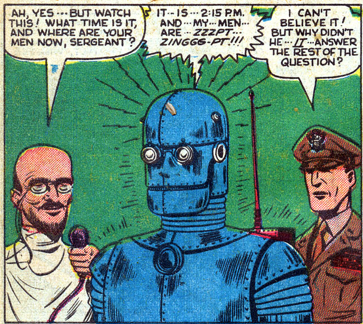 Thinking the scientist off his rocker, but needing the bucks, Fletcher agrees and enters the machine. The prof. sets the way-back to the future and, when Fletcher exits the gizmo, he’s traveled in time. The dinosaurs that dot the landscape point to a crossed wire somewhere, but Fletcher soon learns that he is in the future destroyed by atomic bombs. 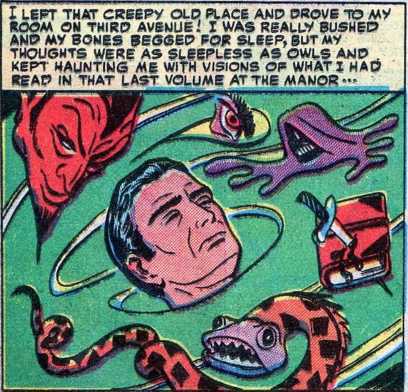 He pops back into the vehicle, returns to the present, finds the Prof. dead in his laboratory, and hits the streets, prophesying a grim future. Seems as though there are a few panels missing here; the death of the scientist is never explained nor is the return of the dinosaur after man’s extinction. Finally, in "The Hollow Men," a reporter is sent to investigate a village terrorized by a madman’s robot. Truly awful SF tale, but laughable at times. The reporter carries a gun and suddenly decides he can arrest someone. Amateurish art. The GCD credits that cool Venus cover to Werner Roth, an artist I never thought very highly of. 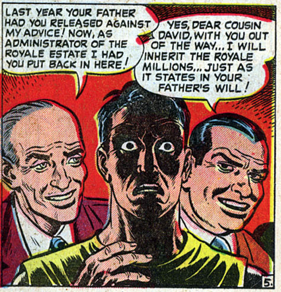 And speaking of artists, why did Mike Sekowsky last so long? Was he ever any good? I love the Justice League but his art is really hard to take. Great post, as usual! Thanks, Jack. 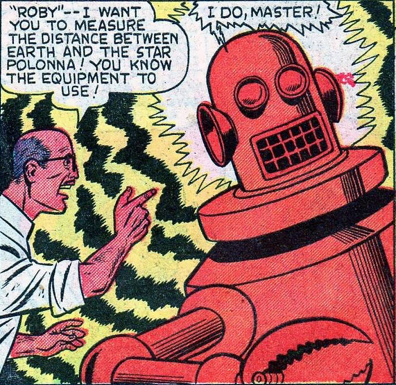 You know how I feel about Sekowsky! I'm finding some very good Werner Roth here and there. I'm a little curious about one thing. 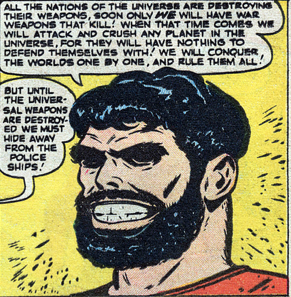 Is "I Deal In Murder" anywhere close to the first Atlas SF story with a Communist spy as the villain? I know these stories (although it's probably post-Code stories that I mainly know) almost entirely from reprints in "Where Monsters Dwell" and so many similar titles, and the Commie spy / saboteur became about the biggest cliche in them. It's a great question. It's probably the earliest in the Atlas anthos but I haven't read the hero books Atlas put out in the 1950s. Surely, anti-Commie Stan peppered those with stinkin' Russian villains. 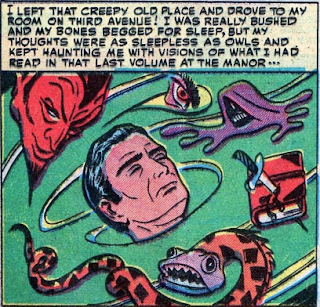 Again, I think a lot of the stories I mean are relatively late ones, that were reprinted in those comics from 1970 onward. 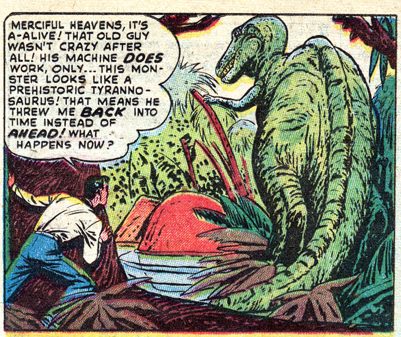 For some reason, it's often the all-out monster stories that have the Cold War stuff. Often the monster becomes a kind of accidental hero, just by having his invasion or rampage right in the middle of some Communist plot!